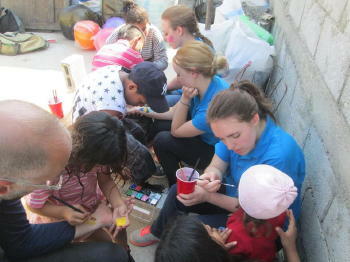 Along with the United Youth Corps and Good Works, LifeNets again co-sponsored a project at the Eagle's Nest Orphanage in Guatemala. It took place from December 25, 2015 to January 8, 2016. It provided $3000 in support for children's activities and help with air fare for the Australian participant. LifeNets helped to fund the activities that United Youth Corps team-members ran at Eagles Nest Children’s Home and field day activities that were shared at two church picnics held with the UCG congregations in Guatemala City and San Marcos. During our time at Eagles Nest Children’s Home, United Youth Corps participants plan activities each morning that provide the children opportunities to be creative and have fun together. 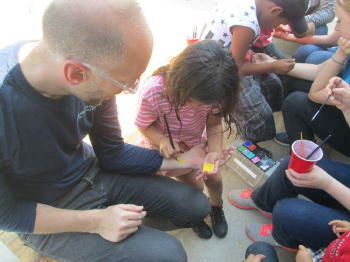 This year the activities centered around the theme: You are More Precious Than Gold. 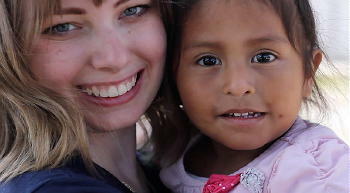 As has been done in the past, the children learned dance moves which ended up being a part of a music video put to the theme song: Gold by Britt Nicole. 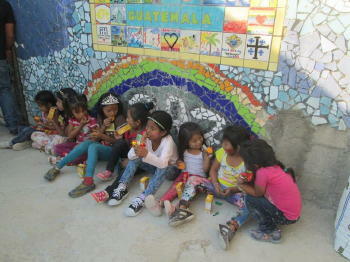 Children (age 5-17) worked together to make a mural which is now hanging in dining room at the Children’s Home. Each child received a canvas panel that had a part of the tree and a bird traced on it. The children then used acrylic paints to complete their masterpiece. Matthew 10:31 “So do not be afraid; you are worth more than many sparrows.” was included on the mural to emphasize how valuable the children are in God’s eyes. 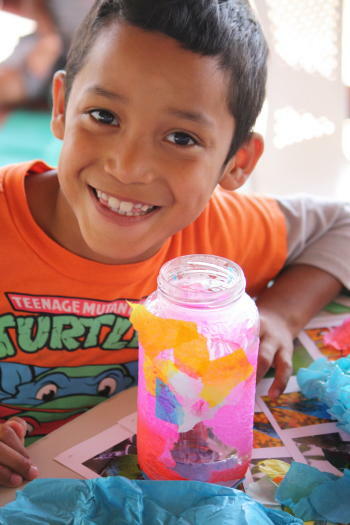 Depending upon their age and abilities the children also made tin can lanterns, stained glass candle holders, sun art pictures and played game and activities which encouraged them to use their English skills. The toddlers and babies had enjoyed exploring specially planned activities that engage their natural sense of curiosity and worked on developing both their fine and gross motor skills. During our final day with the children, the Youth Corps Team hosted an “Amazing Race” day, played field day activities and had fun swimming at the pool. 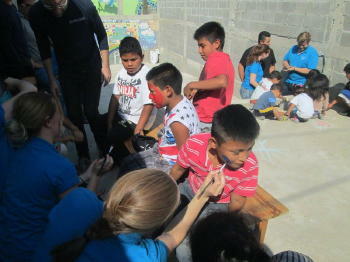 The children loved getting their face painted, playing with a giant parachute and playing games together. It was a great way to end a very successful trip! 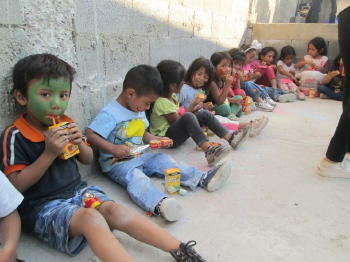 Thanks to the generous support of Life Nets, team members of United Youth Corps were able to host a pre-school field day for the children who attend the Hope Renewed preschool at the Guatemala City Dump. The Guatemala Dump is home to thousands of impoverished families who search through the garbage to find recyclable plastics, metals and things to be repaired. 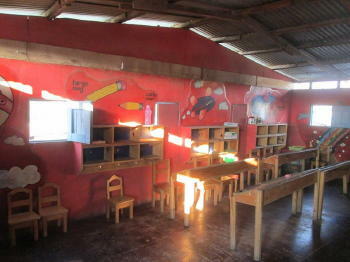 Hope Renewed offers the kids there a chance to improve their lives and escape the cycle of poverty through education. The team played games, had face painting, provided a snack and gave a donation to help to help purchase school supplies for the upcoming year.